Failure to follow instructions on preparation and storage may make your baby ill.
1. Wash hands well. After 6 months of age, if you are using a beaker it is not necessary to sterilise equipment, though you should ensure everything has been fully cleaned. If you are using a bottle and teat, sterilise according to manufacturers' instructions. 2. Ensure top of carton and scissors are clean. Shake carton well, snip open and pour into beaker or sterilised bottle. Add lid to beaker or sterilised bottle. Add lid to beaker or sterilised teat and cap to bottle. 3. SMA® PRO Follow-on Milk can be fed at room temperature. If required to heat, stand filled beaker or bottle in warm water. 4. Before feeding shake the beaker or bottle well. If warmed, test temperature by shaking a few drops onto the inside of your wrist - milk should be lukewarm. All babies are different but try to ensure that from 6 months to 1 year your baby has 500 - 600 ml of SMA® PRO Follow-on Milk per day, either as a drink, on cereals or mixed with food. Before opening store in a cool, dry place. Once open, store only in the fridge (5°C or below) for up to 24 hours in the carton, corners turned down. For best before end date see top of carton. 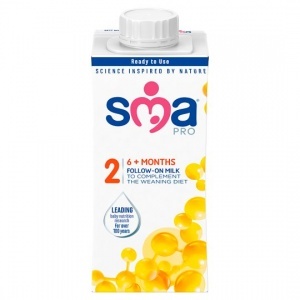 SMA® PRO Follow-on Milk can be poured over cereals and mixed with food. Do not warm feeds in a microwave, hot spots may occur and causing scalding. Remember, cows' milk should not be used as a drink the first year.